BANGKOK -- A bomb exploded Monday within a central Bangkok shrine that is among the city's most popular tourist spots, killing at least 18 people and injuring more than 100 across a hectic intersection surrounded by five-star hotels and upscale shopping malls. With a powerful flash caught on security video and a boom heard blocks away, the blast from the improvised explosive device scattered body parts across Rachaprasong intersection, spattered blood, blasted windows and burned motorbikes to the metal. It exploded during evening rush hour as the area was filled with tourists, office workers and shoppers. "Suddenly there was a big boom, and the whole room just shook, like someone dropped a wrecking ball on top of our ceiling," said Pim Niyomwan, an English instructor working on the eighth floor of the building right next to the shrine. "The whole building just shook. My four students were hysterical." Video shortly after the blast depicts a scene of shock and desperation: people running for their lives and crying amid the debris. An emergency worker in an ambulance, frantically pounding the chest of a victim. 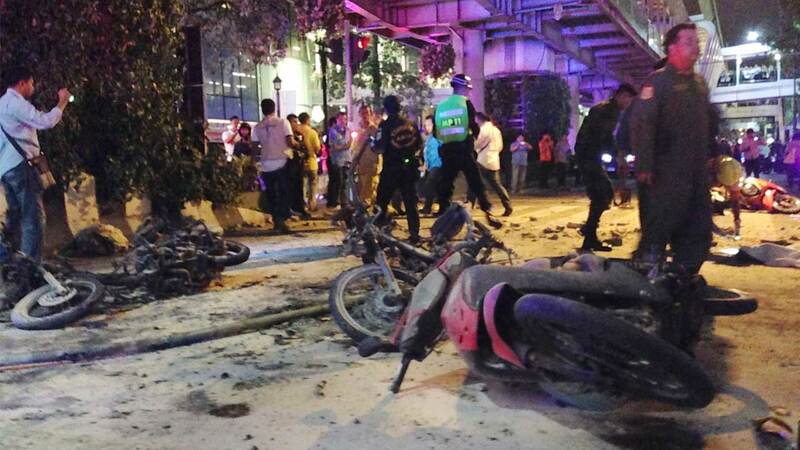 "Those who have planted this bomb are cruel," said national police chief Somyot Poompummuang. "They aim to kill because everyone knows that at 7 p.m. the shrine is crowded with Thais and foreigners. Planting a bomb there means they want to see a lot of dead people." At least 18 people were confirmed dead and 117 injured, according to the Narinthorn emergency medical rescue center. The dead included Chinese and a Filipino, Somyot said. As a single, devastating blow to this Southeast Asian metropolis, Monday's bombing has no equal in recent history, though Thailand is no stranger to violent attacks. A more-than-decade-long insurgency by southern Muslim separatists has left more than 5,000 dead far from the capital. In Bangkok, politically charged riots centered on this very intersection in 2010 killed more than 90 over two months. Police said the bomb was made with a pipe wrapped in cloth. Police said it was too soon to determine the motive. "We still don't know for sure who did this and why," Deputy Prime Minister Prawit Wongsuwon told reporters. "We are not sure if it is politically motivated, but they aim to harm our economy and we will hunt them down." The bomb detonated at Erawan Shrine, which is dedicated to the Hindu god Brahma, but is extremely popular among Thailand's Buddhists as well as Chinese tourists. Although Thailand is predominantly Buddhist, it has enormous Hindu influence on its religious practices and language. The shrine, adjacent to a five-star hotel, is at the intersection of two major arteries in the city. Throngs of tourists come there to pray at all hours, lighting incense and offering flowers purchased from rows of stalls set up on the sidewalk along the shrine. The site is a hubbub of activity, with quiet worshippers sometimes flanked by Thai dancers hired by those seeking good fortune, while groups of tourists shuffle in and out. Bangkok has been relatively peaceful since a military coup ousted a civilian government in May last year after several months of sometimes violent political protests against the previous government. Anusit Kunakorn, secretary of the National Security Council, said Prime Minister Prayuth Chan-ocha, the former army chief who orchestrated the May 2014 coup, was closely monitoring the situation. Another source of recent tension is the annual military promotion list, with the junta's top two leaders - Prime Minister Prayuth and Deputy Prime Minister Prawit - widely believed to be supporting different candidates. The reshuffle, which comes into effect in September, has traditionally been a source of unrest, as different cliques in the army, usually defined by their graduating class in the military academy, seek the most important posts to consolidate their power. The U.S. Embassy in Bangkok issued an emergency message for U.S. citizens, advising them to avoid the shrine's area. "We didn't think anything like this could happen in Bangkok," said Holger Siegle, a German who said he and his newly wed wife had chosen Thailand because it seemed safe. "Our honeymoon and our vacation will go on, but with a very unsafe feeling." While bombings are rare in Bangkok, they are more common where the Muslim separatist insurgency has been flaring: in the country's three Muslim-majority provinces in the deep south. In March this year, several arrests were made in connection with a grenade that was tossed at Bangkok's Criminal Court. Those detained were apparently sympathizers of the pro-Thaksin Red Shirt movement. Critics of the current military government say some of the bombings may have been carried out by the junta to justify its continued suppression of basic rights and liberties. The government denies that. In April, a car bomb exploded at a shopping mall on the resort island of Samui, injuring seven people. The motive was unclear, though the government suggested it was linked to politics. The last major bombings in Bangkok occurred on New Year's Eve at the end of 2006, when a series of bombs at celebrations around town killed at least three people and wounded dozens. Those bombings occurred just three months after a military coup ousted Thaksin, and there was speculation that his supporters carried out the attacks in revenge. However, the bombings were never solved. The 2006 coup set off a battle for power among Thaksin's supporters and opponents, sometimes in the form of violent protests. Protesters from both sides sometimes faced armed attacks by unknown groups, with more than 90 people killed in 2010 during pro-Thaksin demonstrations that were quashed by the army. The focus of the 2010 protests was the same intersection where Monday's blast took place. Erawan Shrine itself also has been a scene of violence. In March 2006, a man who smashed the statue of the four-headed Brahma with a hammer. The man, believed to be mentally ill, was lynched by bystanders. A new Brahma statue was installed at the shrine within months.